First, and super important, sorry for the radio silence! “Buttocks! Buttocks! Buttocks!” This student learned the word “buttock” when classifying body parts as part of the head/trunk/limbs in my private class and decided to run around the classroom the next day pointing to her own “buttocks” and repeating the word several times. Good stuff, right? Soon I’ll upload some pictures of the Valentine’s cards that I received from students. They are definitely worth the wait! I have realized over the past couple of days that I am really disconnected from a lot of pop culture here in the States since I’ve been gone so long. I’m out of the loop! Maybe that’s a good thing? In your opinion, what’s the most important thing that I’ve missed in the past few months? Being at home brings up the same set questions from both friends and family members. When am I coming home? What will I do when I come home? Will I work or will I get a Masters degree? Am I dating anyone? Yes, it’s true! I bet all temporary ex-pats will feel me on that! Wanna know the answers to those questions? I don’t know. I don’t know. I don’t know. Doesn’t seem to work out in my situation. Sound familiar? To tell you the truth, I’m unsure about almost everything regarding my future. Is that really such a bad thing? I’m open-minded and I’m eager to find some direction, but I know that it can’t be forced. Today I found a really interesting quote about one’s path. This quote really got me thinking. Sometimes I get frustrated and upset that my peers have “got it together,” but what’s my rush? I have at least 7 more months in Spain before I set foot on American soil again and that is time to explore my options and see what I can come up with. I am the first one to say that I don’t “have it all together” when it comes to future plans, but I should congratulate myself on what I’ve already accomplished. I moved to a foreign country (alone), I speak a foreign language everyday (and sometimes more than one! ), I live by myself, I’m a great worker, and lastly I am managing my money and working hard to support myself and the lifestyle that I want to have in Madrid. I’d say that those are great accomplishments and I should be very proud! The future accomplishments will come later… and boy will they be great! Hello from the States! I am so happy to be spending Christmas with my family. I’ve really missed them! So far I’ve had plenty of yummy food and I’ve given and received quite a few bear hugs. The only negative to this situation has to be the jet lag… I woke up at 5AM yesterday and today. We’ll work on it! Speaking of jet lag, click on the picture to be linked to a great article with some jet lag tips for those of you in my annoying situation! The turkey. 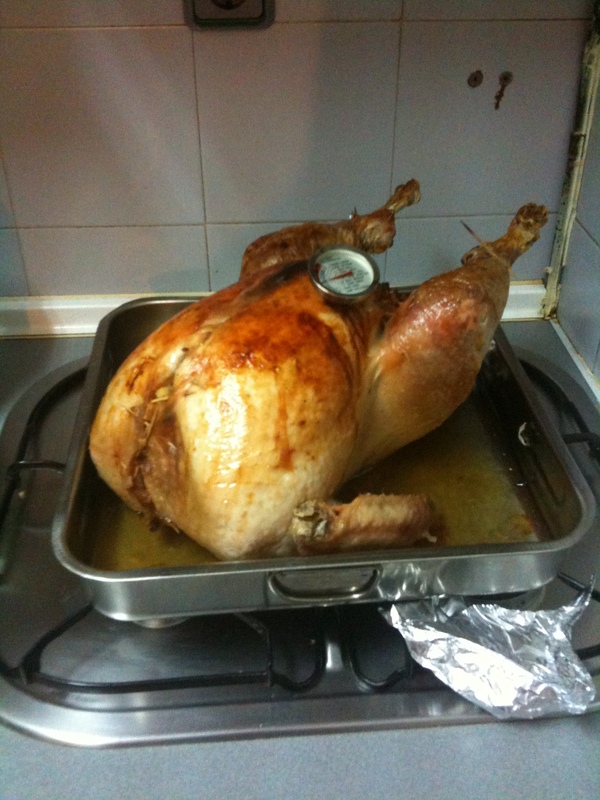 Finding a turkey in Madrid isn’t sooo hard… it’s just finding one that isn’t 18kg (just under 40 lbs) or another way-to-big size that can be an issue. This turkey was big, but not toooo big! Our food. 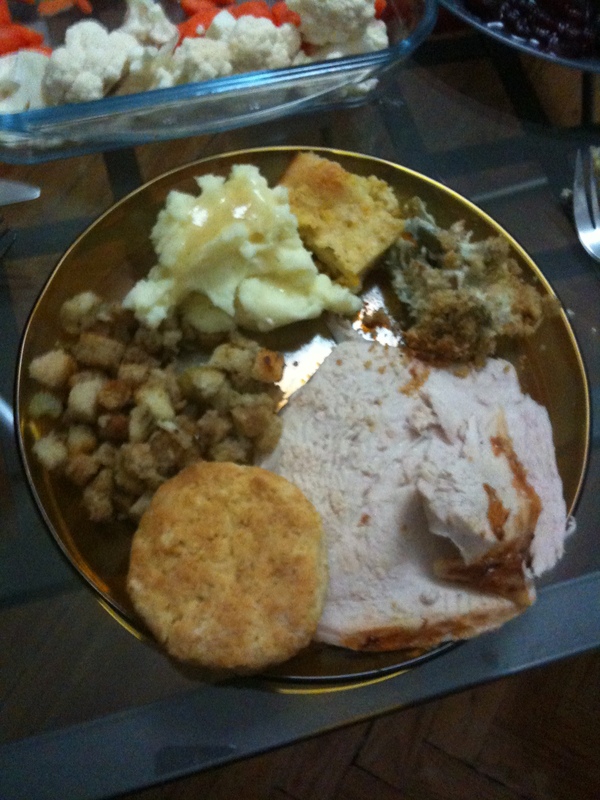 Biscuit, stuffing, mashed potatoes with gravy, corn bread/caserole, green bean caserole, and turkey! On Monday we went to Aveiro. If you look on the map, it is just south of Porto on the coastal side. We took a train from Porto to get there and it was only 5,60 roundtrip. Not bad! Each way was about one hour. Aveiro is famous for a couple of things, one of them being ovos moles. We had to get some! They are made from egg yolks and sugar. The texture was a bit weird to me, but I enjoyed the taste. They mold them into a bunch of different shapes. I think I had a pinecone-shaped one. Aveiro has a canal system, which was nice to see! We didn’t do a boat tour, but I snapped a quick photo. While we were there we toured the university campus, went shopping, ate a lot of sweets, and took a bajillion photos. Overall it was a nice place, but I didn’t think that there was so much to do there. I would definitely recommend it as a daytrip and nothing longer. I’ve spent the last 4 days in Portugal and I’ve had a great time! 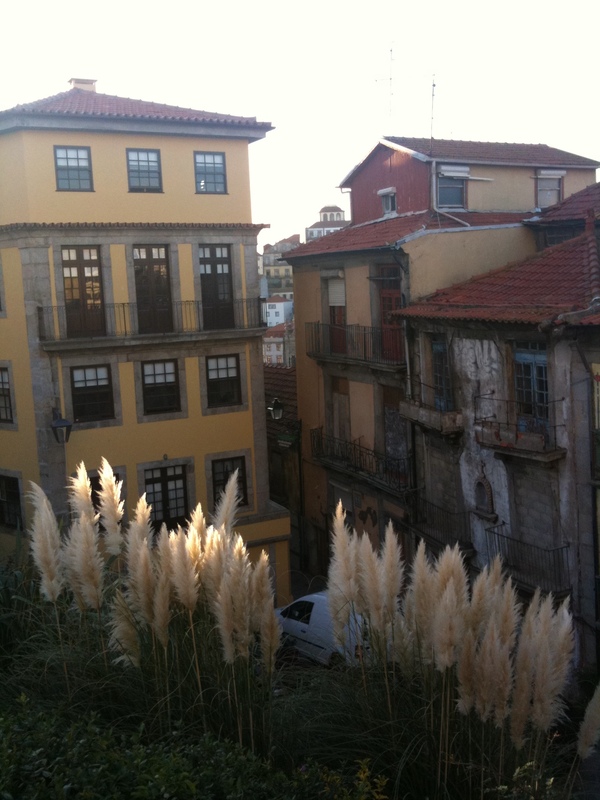 I stayed in a suburb of Porto with a friend in his family’s home. *NOTE: We took a day trip to Aveiro, but I will write a separate blog post for that. * His family was so nice and I really enjoyed seeing the everyday aspect of their lives. Leça da Palmeira (my friend’s town) has a beach, but most of what I saw was pretty rocky. My friend told me that there is a section there that is mostly sand and that’s where he goes. Although very rocky, the beach was beautiful! We went to the roof of an old chapel and took pictures on the rocks. Here are a couple of photos! You have to get down from the rocks somehow!! Porto is a beautiful city! I’m really glad that I got the chance to see it again, as I only stayed for less than two days on my last visit. I like that it feels really old. A lot of the buildings are rundown and dirty, but I think that it adds to the beauty. Among the older/dirtier buildings there are plenty of really nice modern touches to the city. For example, the bridge between Porto and Gaia is beautiful! It overlooks the river and the lighting is spectacular! This last scenery photo was taken from Sé do Porto. From there you have a great view of Porto, as it is on a hill. Look out for my post on Aveiro! Olá! I’m back in Portugal! Maybe I’m obsessed? This is my third visit in 6 month. Maybe I’m in love with pastéis de nata, lulas grelhadas, and fado…. Oh how great it is to speak Portuguese again. More photos and stories to come! I’ve only been here for a short while, so I don’t have anything to report… Yet! A lot of my friends have asked me the same question. “How young is your youngest student? And WHAT do you do with them?” I agree that young children can be difficult to tutor since they have such a low level of English BUT they learn so fast! I love teaching young students (1st, 2nd grade) because I can be silly with them and they are like sponges! They have the potential to learn very fast. Also, they tend to be less nervous and embarrassed about speaking out loud and possibly making mistakes in English. Here are some things that I like to reinforce/teach my youngest students (5-6 years-old). My first and most important tip is: make it fun and remember that they are small children! If they aren’t paying attention, try something else! It can be frustrating, but you will get the hang of it! Numbers –Numbers are a very important vocabulary set! The younger the child, the smaller the numbers are. For instance, I will don’t like teaching a five-year-old to count to hundred in English right away. I usually stick around 1-20, 1-50 etc depending on the child’s level, at least at first. What I’ve done recently is I’ve made flashcards with the number set on them and I ask the child to identify the number as I pull it out of my deck. I start with them in numerical order and then I mix it up. It’s a lot harder when they don’t go in order! Then I sometimes play a memory game where I flip them all over and ask the student to flip them face-up and say the number. Then they put them in numerical order, in both ascending and descending order. Colors – Another important set of vocabulary! Children love colors, so why not make it fun? I like to do coloring activities and “tell me what color this ____ is” games. For instance, I used to play Barbies with a young girl and I’d ask her questions like “What color is this?” and I’d point to Barbie’s dress or her handbag etc. With older students you can make it a little more complicated and ask the color of something in the room without pointing to it. Then they have to understand what the object is and then tell you the color. “I Spy” is a good game for this! Animals – I LOVE ANIMALS! There a many ways to introduce different animals. I like starting by coloring animals and talking about our favorite ones. “I like giraffes. Do you?” Then I encourage the student to answer, and then ask me the same question with one of their favorite animals. You can also play a modified “20 Questions” game to guess what animal you are thinking about. Pick an animal and ask the student to ask you questions about it to guess what it is. Depending on the level, you might need to help them with the types of questions that they should ask you. Ex. What color is the animal? Where does it live? Is is big or small? Shapes/basic articles of clothing/basic phrases are also important, but I won’t bore you with the longer explanations. I give you credit J you probably know what to do for these! There are obviously many other topics that you can cover. These are just a few that I could think of off the top of my head. I hope that this helps some potential or future tutors! Feel free to leave comments! I’ve been playing on a volleyball team here in Madrid and it’s going really well! We start out tournament matches next Sunday and I’m pumped! In December a few of us are going to a tournament in Frankfurt, which sounds pretty awesome. Who else can say that they’ve played in an international volleyball tournament in Germany?? Apart from volleyball I’ve been trying to jog a lot more. I have an American friend that plays volleyball with me and we are working on jogging in Retiro at least once or twice a week. It’s nice to have someone to jog with. It gives me more motivation to actually do something! I’ll do other things when I don’t meet up with her, but those two days a week will really help! This can only end well, guys! I’ll keep you updated, of course.